Blog: Bad Feels in the Heels? Bad Feels in the Heels? It shouldn’t be a surprise that the heel is highly susceptible to pain, given that it takes on the stress of roughly 1.25 times our body weight hundreds of times daily with each step, and 2.75 times when we run. The heel is designed to provide rigid support for our body weight, as well as absorbing the shock of the foot when we walk, run, skip, or jump, and it propels us forward into our next step. Heel pain is usually caused by repetitive strain and stress to the heel, rather than being caused by one injury. If you are experiencing pain in the heel of your foot, treatment could be easier than you think. The use of custom orthotic inserts can help your worn out heel absorb shock, as well as cushion the arch, to help alleviate pain in the foot and heel. If you would like to see if custom made orthotic inserts are right for you, give us a call today to set up an appointment. Dr. Michael Horowitz offers a 5-Step process for relief & treatment of heel pain in Vancouver. 1) evaluation, 3) custom orthotic fitting, 4) orthotic dispensing, 5) follow up care. Call me at 604-737-3668 to discuss further or email Dr. Michael at info@vancouverorthotics.ca to take action & solve your heel pain issues today. Thank you so much for your interest in what we do. We're here for you and want to put that Spring back in your Step! 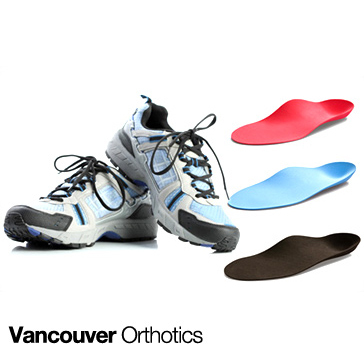 You can Book Online or call 604-737-3668 or "Ask Dr. Michael" by emailing info@vancouverorthotics.ca consultation & postural examination, 2) electronic gait scan analysis, 3D foot scan & biomechanical.